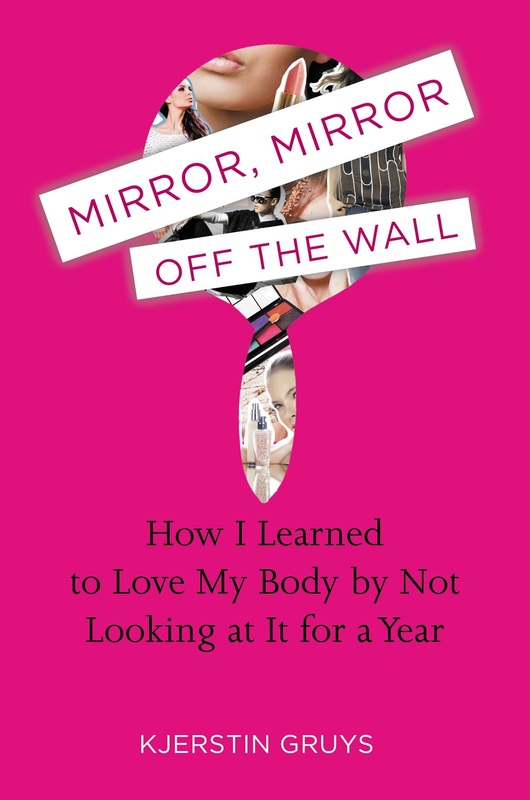 My first book, Mirror, Mirror OFF the Wall: How I Learned to Love My Body by Not Looking at It for a Year is available to purchase via Amazon, Barnes & Noble, Books A Million, Indiebound, iTunes and wherever books are sold. 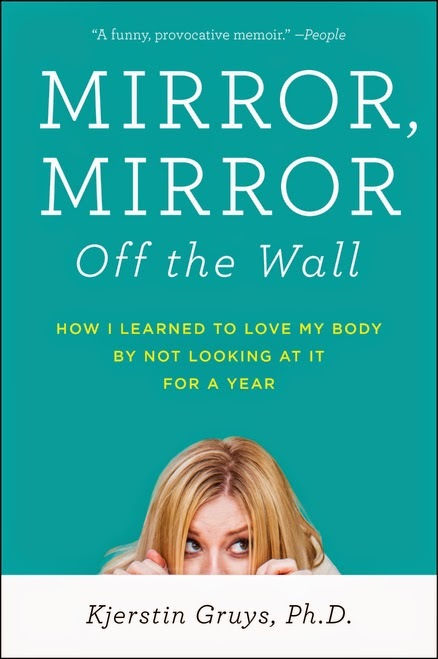 Mirror, Mirror Off the Wall: How I Learned to Love My Body by Not Looking at It for a Year tells the story of Kjerstin Gruy’s quest for personal growth and self-acceptance. She swore off mirrors (and all reflective surfaces) for a whole year, just months before her wedding, even forgoing a final once-over before her walk down the aisle. Written in Gruys’s hilarious and very relatable voice, Mirror, Mirror Off the Wall is her keenly observed memoir of personal growth merged with timely social commentary on our culture’s unhealthy obsession with beauty. As a recovered anorexic whose flair for fashion and curiosity about body image led her to pursue a career as a fashion merchant and later as a PhD candidate in sociology, Kjerstin Gruys found herself in a predicament as “a body-image expert with a body-image problem.” So she took matters into her own hands in a society that both prizes and stigmatizes physical beauty. Her story offers a refreshing take on what it means to cultivate a positive body image. "Kjerstin nimbly deconstructs the internal struggle between the desire to accept ourselves and the desire to be accepted by others. Her story is an important reminder that what we see in the mirror is not just our reflection but a reflection of the society in which we live." I will definitely be reading this. I started following you mid last year and have loved reading your posts and I felt like I was on the journey with you. Congratulations and I can't wait! I would love to do an email interview with you for our non-profit site for authors. You can find out more info at www.hotlitbooks.org. If you are interested please let me know. Your story was amazing tonight on 20/20. Great inspiration to us all! Congratulations on your achievement! I saw you on 20/20 and thought it was a real inspiration! More of us should be more concerned with how we feel rather than how we look!! Thanks!! Good for you! You are absolutely correct and as a man, my image of beauty is an image of a woman such as yourself. I just watched the clip of the 20/20 show. Wow! That is a wonderful story. What an inspiration you are, I hope you can touch many lives especially young girls with your story. Just from watching you on the 20/20 show I can see that you are a beautiful young lady on the inside and out. Thank you. Your story is so inspiring! I wil try as long as i can with no mirrors, but I don't think I'll be as good as you! Hi, my name is Angelika. I am German, living part-time in my palapa-jungle house in a little (car free!) fishing village 'Yelapa' in Mexico and part time with my American husband in Hudson, Florida. I've experienced a radical spiritual awakening through covering up my mirrors 12 years ago in Mexico. I have not looked into a 'normal' reversed mirror ever since. I am writing a book myself called "Beyond The Mirror World". Ever since I am giving people their true identity back. First through the "Video with a difference" (videofeedback 10 minutes alone! with yourself) and then in 2006 through finding John Walter's True Mirror! A non-reversed 3-D mirror (a combination of 2 optical 'front-surface' mirrors that join at exactly 90 degrees to form a seamless true-image). I have shown this True Mirror to hundredth of people, men, women, children and the reactions are amazing! I would love you to have that experience for yourself to see what I am talking about. Kudos to you for doing this! I'm currently completing my own eating disorder recovery book and always encourage others to try living without the scale, since there are so many other ways to gauge health and fitness. I think I'll keep my mirror because I think it's important to learn to focus on what you DO love about your body, and flaunt it! you are a inspiration! i can only say thank you thank you thank you! we need more people like you in this world! i am from brazil, just so you know how far you have reached! you have my respect! This world is so sick ! Everyone who think you are fat or ugly has a mental problem. You are a regular women with a regular body. You look good and you have carisma. I saw you on german television and I've got to say you're such an inspiration for all women of the world! don't take any care of those negative comments! You're a beautiful woman and I wish you and your husband the very best :) keep on being the woman you had been without mirrors :) greetings from Germany! Just saw you on the Jeff Probst show and was inspired to share your book and blog on my blog www.ilostmy30s.tumblr.com. Your journey was very inspiring and such a good lesson to be in the moment and live life from our hearts. You are a beautiful and soulful woman and I wish you and your husband a long and happy life together. You are an inspiration for all woman and men!!! it's Angelika (yelapaangel) who told you about the non-reversed TRUE MIRROR.. I see you've published your book. Congratulations! I'm just wondering... you never got a True Mirror, how come? Did you go back to looking at your 'normal, reversed' mirror image? Laurel - I'm so glad you're enjoying the book! Body acceptance is so worth it. Good luck! Hello. Thought I would personally drop that you simply comment. Although We do accept many your statements, We do not concur together with the last one. Just doesn’t mesh along with the whole and may even a little bit adjustment. Have you considered enhancing your site’s visibility with additional social media exposure? Gather more information out of this site now more info. Incredible, amazing website construction! Just how extensive have you been blogs regarding? you make running a blog appearance straightforward. The full seem within your web page is fantastic, along with the information! I will just be awesome and quiet to see this information. Hello everyone! If you require the service of a professional hacker to help track your partner's cell phone remotely, contact deadlyhacker01@gmail.com, he was efficient in helping me hack my husband's phone without physical contact. Tell him Stacey referred you, he'd help. I had got this tool for gems of pokemon go online here. I was searching the great technology is visible in this blog that to using the nice services in this blog. This is really admired for using the nice services in this blog and sharing the great info is visible in this blog. Thanks for such a nice post. Hope that you will post more like this one. I am happy to find your distinguished way of writing the post. New Version Update here: Clash Royale Hack Gems Appreciate!